Jeff Brauning's run to a conference-record hitting streak was almost cut short in 1989, by a scorekeeper's call, The Moscow-Pullman Daily News wrote. It was a hit that went off the running outfielder's glove. Originally scored an error, the ruling was changed after protest and review, The Daily News wrote. "I didn't want any controversy, but I hit the ball hard and he had a long way to run," Brauning told The Daily News after the April double header. "It wasn't a play you make with ordinary effort." Brauning's hitting streak with Oregon State that year ultimately stretched to 31. He also soon turned pro. Brauning's chances at hitting streaks in the pros, though, were few. He played just two seasons, never making it above high-A. Brauning's professional career began that year in 1989, taken by the Giants in the 26th round, out of Oregon State. At Oregon State, Brauning knocked in a 10th-inning game-winner in a 1988 game and hit two doubles in another. After seeing his 1989 hitting streak snapped, Brauning then went on to hit safely in another eight games. The streak stood until 1994, when it was broken. With the Giants, Brauning started at rookie Pocatello, hitting .244 in 36 games. He also knocked in 12 and stole 12. In a July game, he scored a run after hitting a single and stealing second. That same year, he also got 28 games at single-A Clinton, stealing another five bases and hitting .226. 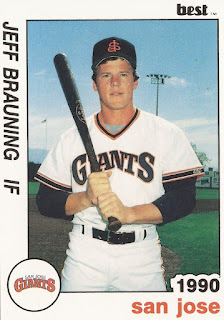 For 1990, Brauning moved to high-A San Jose, getting into 99 games and hitting .278. He also st ole 17 and had 45 RBIs. For Brauning, though, it was his last of just two seasons in the pros.